I found myself at a great steady table no one out of line. I was getting walk after walk and then Andy Black joined and sat on my left. I told him what a pleasure it had been for me watching him play the 2005 WSOP, where he finished 5th. Somehow I had managed to bet the turn and river for value, OOP with 3rd pair. I’d defended Dan’s pre-flop raise from MP with 89o in the BB. Andy Black saw me drag the pot and was curious of the action. “Thin value on the river, sometimes you just know where you are…” was my commentary. The small blind looked at his cards and I read him as weak and told him so, SB responded by raising to 11K with blinds 5,000/2,500 I defended with Q60. Flop was 579 giving me a gutshot and the SB raised to 11,500K I re-reraised to 28,000 and took the pot down then showed bluff – Big mistake. A mistake that would cost me in the very next hand. Next hand Alan Kelleher raised to 11K from the hijack and I made it 25,00 with AQ0 from the SB, Andy Black folds his BB. Mistake 1. Showing the bluff the hand before. Mistake 2. Re-raise large OOP as I want to take the pot down pre I should have made it 32K as 2 out of 3 times I’ll be Ace high only after the flop. Mistake 3. 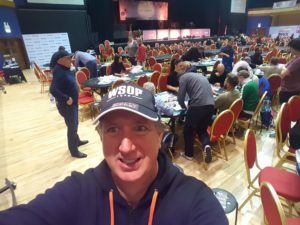 I check the QJ5 flop – Always bet your big hands! There is 60K in the pot I need to take it down, I’m vulnerable to an over card and draws. Mistake 5. I shove the river, I believe I’m being called with all aces and I wanted to make it look like a bluff shove by insta shoving. If you don’t know where you are don’t bet your tournament life away. Alan’s K 10o made him a rivered straight and eliminated me. Alan came 2nd for 55K the next day and it could have been me! “Fucker” I screamed, it felt like I’d been punched by Tyson, they were verifying that Alan had me covered. Andy Black shook my hand, but I was out for the count, I’d fucked myself for no good reason. I left the table, I hope I wished everyone well and Alan good luck but I can’t be sure. I hope to lose with grace and say “That’s poker, good luck everyone, it was a pleasure playing with you…” but in this instance I worry my only words were “Fucker”. Let’s hope I’m wrong, I don’t want to be that guy. Correct play, bet 45K on the flop and shove the turn, if he’s hit a set or two pair so be it. He’ll tell you if you are beat, Alan may have shoved over a decent flop bet with his draw but deal with a problem when/if it arises. With the information I had, my top pair top kicker was good. Aces and Kings would have been re-raise pre-flop, I’m only losing to Jacks, JQ, Queens unlikely as I have one and slow played aces. Get the job done bet hard and move forward in the tournament. It is hard to get to these spots in high buy-in tournaments and you can’t afford to make such basic mistakes. At the end levels of tournaments the point of honesty moves forward in the hand, if my raise is bigger I maybe get the job done but by showing the bluff, Alan an older player became more stubborn and it cost me. Two bad mistakes. It won’t happen again. 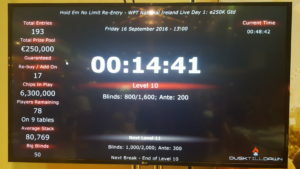 I came 40th out of 260 runners in the WPT main event 1,100 Euro entry 260,000 Euro prize pool 27 paid. Day one played tight avoided trouble hands and found one or two spots to steal. I was very card dead and very patient. Every hand can be your last so before you open a hand ask if you’ll be happy to go bust with it. If they have aces are you going to go bust with top pair? 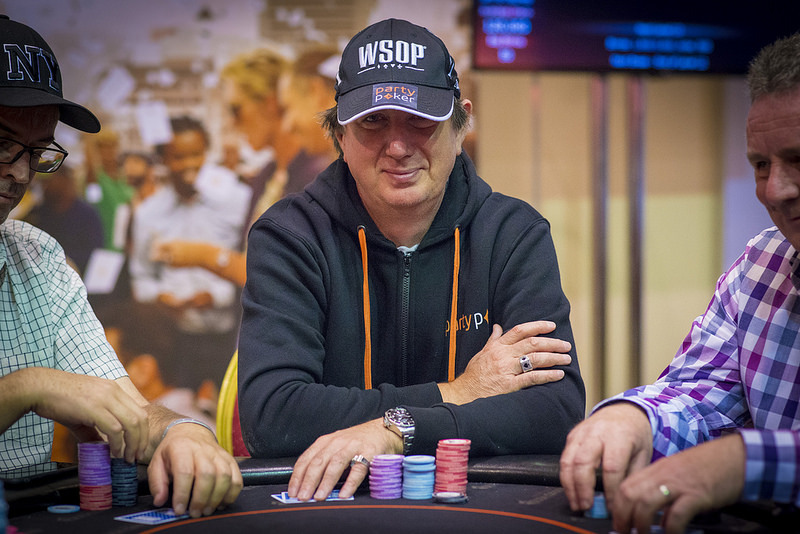 Marc MacDonnell was the most active player at the table. He was the only one 3-betting and twice took down pots on the button to mid-position raises when they were followed by a call. I made sure everyone was aware of my observation and told him he better get ready for some light 4-betting. He raised the button to 1,500 and the small blind completed, I re-raised to 6,000. Marc checked me over and finally re-raised to 21,000 leaving me no fold equity to my 30K stack, I muck showing my Q5o and he tells me he had A8 later in the bar and that I had raised to quickly so he’d put me on a bluff. I found out later who Marc was from a player at the table who said they’d found it funny I wanted to play with one of the best in Ireland and clearly had no idea who he was. Marc donked himself of 4 betting and calling it off to a 5 bet show AQ against a rocks KK, it was the second time I’d seen him 4-bet AQ not my style for me it turns the hand into a bluff when there is no need. I personally like to flat and keep AJ A10 and A9 in the pot and dominated, rather than bet and have them fold and only be called by better. Finished day one bagging 67,500 with the average at 80,769. I over celebrated until 6 am drinking far too may Guinness, slept in my clothes as I didn’t want to wake my brother up. Woke up at 12:30 with 30 minutes to shower and get my head back in the game, before the start of Day 2. 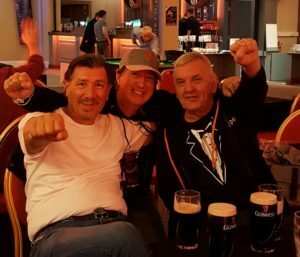 Stupid stupid stupid…..celebrate when the game is won not before…I had made the same mistake before Day 1 when after busting the Grand Prix at level 15 (my Kings were cracked by a K7 flush draw all in on the flop) I took full advantage of the hospitality of the PartyPoker team. I had a great night with Mad Marty Wilson hearing his stories from the circuit in fact it would have been a crime to go to bed any earlier than 5 a.m. The game is about information, the correct interpretation of the available information is the source of the poker money won. When you show your cards without being paid, you are giving away money, sometimes when called I muck my cards face down and hope the villain won’t ask the dealer to flip them over. Even letting people see my bluff cards is information I try to hide. Leave the ego and meta game one gets from showing bluffs to the young guns play like an pro and never show your cards. I’m currently re-reading Oliver Improva Marx’s book “Solving the poker puzzle” but slowly I carry it around and catch a page on a train or bus. If you want to be good put the hours in for every 3 hrs playing have one hour of study. Get to be the best you can be as fast as you can and then play. Don’t do a million hands making the same mistake. I played a hand with Pak_xxx he raised the cutoff and I re-raised from the button with Q10 the flop came KJ7 monotone and I shoved pot size with my straight draw to put him all in and he called with 33. I thought it was a bad call but then I realised I’m never shoving anything there but air and draws and my play was bad. I told him in chat he was only beating bluffs but he knew that and realised that was mainly what I had. If I’d bet a 3rd pot I’m sure he’d have folded…. Rule 20 – Have a system – if you don’t have a system and lose you have nothing…. but if you have a system and you lose you still have your system. Are my opponents playing conservatively? Aggressively? Tentatively? What are some of the hands my opponents are likely to hold? What do my opponents think I have? Should I bet or raise? If I think I have the best hand, I nearly always answer “Yes” and I bet or raise. If I think I can force weak opponents out of the pot with this bet or with future bets, I nearly always answer “Yes” and I bet or raise. Should I check (or fold)? If I think I have the worst hand, I nearly always answer “Yes” and I check or fold. If I think my opponents are strong, I nearly always answer “Yes” and check or fold. After a careful analysis, if I’m not sure if I should raise and I’m not sure I should fold, I feel confident that calling a bet (or checking) is correct. I find that even in straight-forward and obvious situations, by running through the script I often find opportunities that other players might miss. And by asking the “raise” question before the “fold” and “call” question, I ensure that I am playing aggressive, winning poker. Try using this script next time you sit down at the table, and see if simplifying your inner dialog forces your opponents into making more complicated decisions. Turned the nut flush bet half pot and got raised. I thought he may be on a draw and just called to keep his bluffs in, the river brought as second queen I checked he bet and I called. He would have raised if he had a set on the flop, I should have known I was good and re-raised in this spot I left value on the table. If you 4bet QQ then you should call it off. Just to prove my point, let’s run the numbers. vs. the narrowest of ranges (QQ+, AKo, AKs) your hand has 40.2% equity, which means it’s +EV to call off once you 4bet. Flop has one over card, a possible straight, nearly every pair under mine has hit a set and two pair options are obvious. Cut-off raises to 3,200 I call with 19 BB 32,000 behind on the button with JJ and the BB completes. With a cut-off open this is a shove but with position I want to play it as a pair of 88s and see the flop. Need to check if this is a mistake, If I raise and get shoved on I’m rarely good and if I shove and he folds I gain 3.5BB an awkward spot where I fold out the hand’s I want in the pot and keep all those in that trouble me. Flop of 467 rainbow and initial raiser bets 9,000 and I call. Perhaps I should shove here but his near pot size bet looks like an over pair. King on the turn and the villain checks, I check back hoping to get to showdown. River is an 8 and villain shoves to put me all in, I call and he turns over set of eights. I just played a $55 satellite for Caribbean and blew my stack on first hand. Initial raise from cutoff of 600, a re-raise from button to 1,200, call from SB of 1,200, I make it 7,200 with AQ from the BB. The cut-off folds, button folds and the small blind calls. Flop all low small blind checks and I check. King on turn, small blind checks and I shove. Villain calls with the hand I was representing AK and I’m out… just awful. I should have shoved flop if anything. How to blow $55 in a minute and why am I cold 4 bet re-raising AQ? If you have a good stack don’t risk half of it calling all ins with AK. The the main value of AK lies in its fold equity, the value it has when called is a safety net only. I’ve just come 8th when 5 places won a $109 ticket, I called a shove of 45 K when I had a stack of 83K, blinds at 4K , and was facing KJ which was great. He he hit his Jack and next hand I was out running into QQ. There was no need, avoid variance especially in flat payout structure tournaments.